Transfer FTP Files Directly From One Server to Another and Bypass the Huge Amount of Time Required to Download on Your Computer and Upload. As we said for DNS Setup for Rackspace Cloud Sites to Cloud Server Migration and in Rackspace Cloud Sites to Cloud Server Migration Guide like articles, transfer of files for migration reasons is quite important. If you want to deal in complicated situation, you can use Hostgator like B Grade Webhosting for dumping purpose, they practically costs very low (11 USD for “Business” Plan, actually it is Shared Server) plus you’ll get $100 Google AdWords Voucher. There is no loss for that month, you can run PHP scripts, Perl Scripts. Actually, within being same system (we are taking about being on Amazon, Rackspace etc. ), there can be bizarre errors during moving due to conflicts. There is an excellent tool for Rackspace Cloud Sites named Zipit. It is fully free software and you can grab it from Github or Rackspace’s guide pages. It zips and uploads both FTP content and MySQL database to Cloud Files. The Cloud Files container remains Private. You can use Hostgator like web host and change DNS to fetch content if you are not using Rackspace Cloud Sites, in fact we used Hostgator to simplify the migration. It is a fully third party, to the chance of messing up is less. With Clouflare it takes 5 minutes to propagate domain name. Most have many unused domains. In case, both hosts has no root access, still you can use com monad line on your computer to wget* the tar ball. At least you can resume with -c function in case downloading halts. Downloading with GET function (over browser) is risky for bigger files. 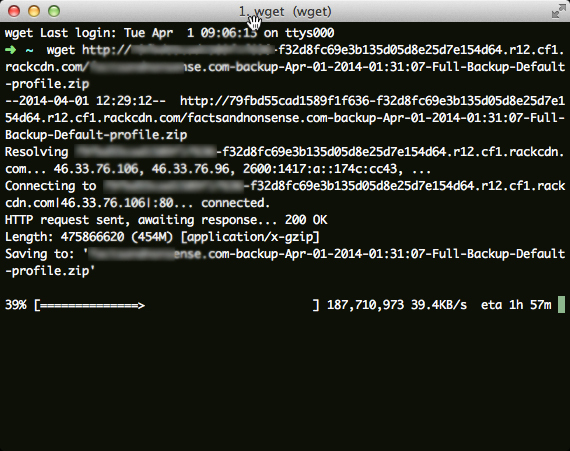 or make the Cloud Files CDN Public and wget it. Obviously, untar it using tar -xzvf command. Note : New Generation Cloud Servers of Rackspace needs no need to copy in this way. You can backup using create image function. Cite this article as: Abhishek Ghosh, "Transfer FTP Files Directly From One Server to Another," in The Customize Windows, April 1, 2014, April 21, 2019, https://thecustomizewindows.com/2014/04/transfer-ftp-files-directly-one-server-another/.